What's Behind the ARAB CRISIS? The 2nd SPACE AGE About to Begin! Well greetings friends, this is Herbert W Armstrong with the good news of the World Tomorrow. Listen, why doesn't God take every new convert immediately to his reward as soon as he is converted? Why must the Christian go on suffering in this world after he is converted? Actually, if a person is really converted his troubles seem only to begin. My friends why should this be? Well the answer is that almost no one today knows the purpose of salvation. Almost no one today understands what salvation is. Now what is God's purpose? Why did God put humanity here on the earth? Why, in a word, were you born? That purpose, as I went into in the preceding program, is really expressed and revealed back in the very first chapter of Genesis. But most of us, as I mentioned then, have read right over it and we never seem to see it. So listen let me just read it for you once again, very briefly. Genesis one verse twenty-four on through twenty-six. "And God said... [and the word there is Elohim meaning more than one person. God is a community, a family of persons, a kingdom of persons]. In the beginning God created the heaven and the earth" (Genesis 1:1). The word for God was written originally in the Hebrew language and in the Hebrew that word is that name — is Elohim. And Elohim is a plural — a uniplural — meaning a number of persons in one unity. One God not many gods, just like there is the one church. Jesus Christ said "...I will build my church..." (Matthew 16:18); and His church is just one church. Not a lot of divisions, not a lot of segments, each one pulling against the other; fighting against the other. One church and you read in the twelfth chapter of first Corinthians that there are many members but the one body. And Jesus prayed that the church might be one as He and the Father are one — they are two different persons. Two separate persons, but they are one. He said that He and the Father were one. And He prayed that the church of many, many members would be one. One church, even as He and the Father are one, and yet there is more than one person in God. Jesus was God changed into, however, into and converted into the human flesh. He was mortal and He was made mortal for the purpose of death. He was human, but He had been divine and He was changed into human. So that in a sense He was both human and divine, but yet He was human and He died for you and for me. But He looked like the Father. Now also He looked like other men and when He came up to Nazareth where He had been born. "Well", they said, "Well, who's this? "Why we don't even think He is a prophet! Why, we've seen Him grow up from a child and He's a carpenter He has worked here, we've seen Him — He isn't any God, He isn't any Messiah. He just looks like an ordinary man." (Matthew 13:54-58 paraphrased) That's the way the people looked at Him and He couldn't perform many miracles up there in Nazareth because of the unbelief of the people. Because they just wouldn't believe He was anything but an ordinary man. And yet He is the express image of God; the Almighty God. My friends, God has made man in His image and very few seem to understand what that is! Now again let me stress and let me put emphasis on this fact: the only thing that God created in the first chapter of Genesis was the physical material creation! Everything mentioned in the first chapter of Genesis that God made or that God created was made of matter. Everything there is physical and that, my friends, was only the start and the beginning! The material with which to go to work in creating the spiritual creation that only began there. Now, my friends, that was not the finishing of God's creation; it was the beginning. And God began it with the physical creation. And I explained how God is reproducing Himself. And that each one of us is an egg. My friends, just as the human ovum has — as scientists tell us — about a 24 hour life. And it has an existence of just a short time. It does not have any actual human life within itself, it just has potential life. But it is not a human being unless it is impregnated, unless it is begotten by the germ or the sperm from the human father. And until then, my friends, it is not an actual human life at all, it is a potential one and that is all. It has its existence, and unless it is begotten, unless it is impregnated in that time — it dies. Now, we are an egg. We live our three score and ten, our approximately 70 years shall we say, and by the grace of God some live a little longer. It is just an existence, BUT WE HAVE NO SPIRIT LIFE — WE HAVE NO ETERNAL LIFE. MAN IS MORTAL, so your Bible says. Now eternal life is the gift of God and, my friends, you do not have it until or unless you receive it as the gift of God. God is reproducing Himself. He made man in His image His same form, His same shape. I explained how man has mind which the animals do not have. They have a brain yes, they have instinct yes. They don't have to be taught, they don't have to be trained. By instinct they do as God has set their brain to do, but a baby, a human baby is the most helpless thing there is. He has to be trained, he has to be educated, he has to be taught, he must learn everything. He doesn't know how to do a thing. He's very helpless; it takes longer for a baby to grow up into a mature man and to learn, and most of us never do grow up emotionally and in some other ways. We don't grow up spiritually like we should. We grow up physically and a good portion of us grow up mentally, but we certainly neglect our spiritual and our emotional development, my friends and it is time some of us began to think about it. Well now, what God completed here was the physical creation. And as Isaiah says, "We are the clay and God is the potter" (Isaiah 64:8 paraphrased). He's the master potter and what He did was to form the clay image to start to go to work on it and that's just where we are. Now in a larger sense, comparative sense, we — each of us — is an egg. And when the Spirit of God comes into us, the nucleus in this egg is the human mind. The Spirit of God cannot come into a dumb animal and the dumb animal does not have a mind that the spirit of God can meet as the sperm cell from the father meets the nucleus within the ovum and a new human life is generated. A new human life is begotten, but as I explained in the preceding program, it isn't a real born baby yet. It hasn't been born — it's only been begotten and it must grow and it must be fed on material food because it is a material being that is coming. And it is to be a human baby so it must be fed on material food. And it must grow large enough to be born. So likewise, my friends, what is begotten in us when the Holy Spirit of God comes; when with our minds we come to see how foul we have been, how far short we have fallen from God's way, from God's holiness, God's righteousness. You know God told us we are to be like He is. He said "be ye holy for I am holy" (I Peter 1:16). "Be ye perfect as your Father in heaven is perfect" (Matthew 5:48 parphrased). Are you perfect? Are you holy? Of course not! That, my friends, is the ultimate goal. Holiness, righteousness, perfection. THAT IS WHAT GOD IS CREATING IN US! Now that's what salvation is — that's what it's all about. Now I'm coming to that, so listen. We can be made as perfect and as holy as God, but God is the one who can do it. I say we can be made that way! Listen, God is the Master Potter. You can't make yourself that way, but will you limit God? Will you say that God can't do it? God says He can and He will, but you have to permit it. Well my friends, God is not just repairing the damage. God is not just trying to restore us to a condition as good as Adam and Eve were before the fall. God is starting out with us to make us something so far better than Adam and Eve were that your mind just can't understand it. No, He's not merely repairing the damage, not merely restoring the saved into a condition as good as Adam was before the fall, but the purpose of salvation is to create in man a holy righteous spiritual character that is as superior to Adam as Adam was at creation — as superior to Adam before the fall as God Almighty is superior to that Adam or to man today! I tell you my friends your mind has not even begun to comprehend what God has in store for you. 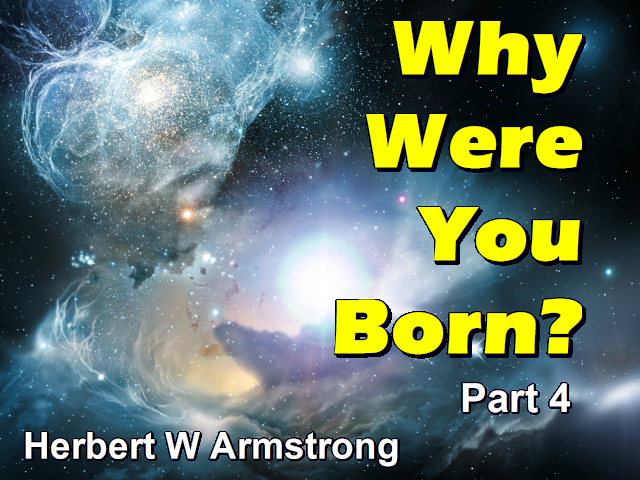 Why you were born — you were born to become a begotten son of God and later a born son. YOU WERE BORN TO BE MADE HOLY! YOU WERE BORN TO BE MADE LIKE GOD. Oh how we have misunderstood, how we have missed our calling. In other words God is the supreme Master Character — spiritual character and God is spirit and man is only flesh. Now listen character cannot be instantly, instantaneously created. That is something that even God cannot do just that way. If God had made a man so that man could not do wrong, could not sin, so that his every thought and action would be in exact accordance with God's laws, everything holy, everything righteous and man couldn't be otherwise — why that man would only be an automatic automaton of some kind just like a machine, that can do only what its maker designed or like the dumb animals. They do just what they are designed. I suppose God could have made one of them more intelligent and more perfect than animals are if He had so willed to so do. You can't limit God, but God is the SUPREME CHARACTER and perfect character is a personal being, a separate entity who has the power to decide, who can think — who has mind to think, to make decisions, and to plan, to devise and who therefore has the power to do wrong as well as to do right. You know that God Almighty has the power to do wrong? Alright I'm coming to that in just a minute. Is it possible for God to sin? Is it possible for God to do wrong? Well I'm coming to that in just a minute. God is the supreme character. And perfect character is a personal being, a separate entity that has the power to make these decisions, to think, to devise, to plan and has the power to do wrong as well as right, but who has the knowledge of right and wrong and the results of each and He knows which way each is going to result and who does make the right decisions — who does make the decision to do the right and who then has the purpose and the will and the power of will to do that right that He has chosen instead of the wrong; that my friends is character. And that's what God purposes to create in us until we finally become composed of immaterial and of spirit substance instead of material substance that is subject to rotting and decaying and that is perishable. Such a character must be a separate entity, a free and independent volition. Now if God made it so we had to do the right thing, that wouldn't be character. That couldn't ever become a son of God! It would defeat God's purpose. Now, God has a purpose — listen, would it be possible now for God to do wrong? Let's look at that. Is God able to sin? Is God able to do wrong? Does He have any power to do wrong? Could God do wrong? Well now, listen. Most people would be afraid to even ask such a question. I'm not a bit afraid of it. Listen — if by that question you mean is there some power that is superior to God? Some force some power that restrains God from doing wrong, that will not allow God to do wrong so that God has no power to do wrong, He is unable to do wrong. Then the answer is an emphatic no, for whatever power could prevent God from doing wrong would be a greater power than God and that would have to be God, because God is the supreme power. God would simply not be God if He could not do wrong. Did you ever think of it that way? Now the answer to it is this — that it would be possible for God to do wrong so far as having the mere power to do a wrong is concerned. God is not someone who cannot do wrong and who automatically just has no control or no power over Himself. God is one who could, but who will not. God is supreme character who sees the end of that way and who decides and has chosen not to do it and therefore He will not. That's supreme character. God has all power. He is the source and the creator of all power, of all force, of all energy, of all laws. God is supreme and yet it is not possible for God to do wrong for one reason only and for this reason it isn't possible for God to do wrong and that is that, God being supreme and perfect righteous character has made choice and God has made the choice that HE WILL NOT DO WRONG and His purpose stands. He will not change it. No other power or force in the world is strong enough to change it. There is no power greater than God, there is no power that can make God do wrong. And there is no power that could restrain Him or refuse Him permission to do wrong. You see God sits supreme and God's will is so absolute that no other power exists which could force Him to do wrong. But God will not do it. Now if you want to construe that to mean that God cannot sin, why of course He cannot. You can be mighty sure that He never will. So listen, God created you, yes YOU as an individual that you might be made like Him. Now you had to be made so you can do wrong too. The only difference is you have done wrong and God has not. There's the difference and of course God has so far greater power than you have. He has limited our power. But listen, if your mind can conceive it, it's just absolutely tremendous. As I mentioned in the previous broadcast, I don't think your mind can conceive the potential possibilities that lie within you. The purpose for which God put you here; your life is tremendously important. You know over in Hebrews the question is asked, "...What is man that God is mindful of him" (Hebrews 2:6 paraphrased). You know when you consider how low we have degenerated, when you stop to think about it a man is pretty small, a man is pretty insignificant and all have sinned. Men are deliberately choosing wrong. Men are doing the things that bring suffering on themselves. Why do men suffer? Why do we have empty lives? Because we have made the wrong choice. God has laid the right way before us and we have rejected it and we have disobeyed God and we are choosing deliberately the wrong way. Now character is when we wake up, when we come to see what we have done, when we repent of that, when we change and decide we will turn around and go the other way. When you make that change in your mind, Jesus Christ has paid the penalty of your sins that stand between you and God. And then when you accept Him and His sacrifice, His shed blood for the remission of your sins, you wipe away the barrier that stood between you and God. You have access to God and then God can put His spirit in you and His spirit comes into your mind and renews your mind and creates within you a new person. It puts within you the very nature of God. Why you have had human nature — now you come to have divine nature, but you also have human nature. What is it? It is the meeting of the two nuclei so to speak. One nucleus is your mind and the other is the spirit of God, which is the mind of God, the mind of Christ. As you read in the New Testament "Let this mind be in you which is in Christ Jesus." (Philippians 2:5 parphrased). The Holy Spirit is the spirit of a sound mind. It's the renewing of the mind and it's the creating of a new creation in you through the Holy Spirit. It's a begetal by which we can be born of God. Also it is a creating of Holy righteous perfect character. But my friends we are separate entities, we have the choice and God has ordained we must choose. He said, "I have set before you life and death... choose" (Deuteronomy 30:19). But He commanded us to choose life and God made it so we must choose. You have to make a decision; otherwise there could never be character. If you are just made so you automatically have to do the right thing, you never could be a born son of God. You couldn't enter the family of God, because God is supreme character and every member of the family of God is SUPREME PERFECT HOLY RIGHTEOUS CHARACTER. That's what God had you born for that you might become that. You are the clay, He is the potter; will you yield to Him? Are you going to stiffen up and resist? — He isn't going to do a thing with you. GOD WILL NOT cram His religion down your throats, He just will not. Now Jesus is God. Jesus is born a Son of God in the very family of God by a resurrection from the dead, but you also read that He is the firstborn of many brethren one of which ought to be and can be you. Will it be, my friend? Now you don't have the power to do it, but God has and He will furnish all the power you lack if you are willing, if you'll make the decision, if you will hunger and thirst for it, if you cry out for and go to God for it. You can become His child — you can become His son — you can be made like unto Him! You can be made like unto Jesus' glorious body. Jesus is the firstborn from the dead — the first born of many brethren. Do you want to be one of those brethren? That you can be like God instead of like sinning cursed man that is bringing curses on himself and pain and suffering and anguish all the time. My friends, think what God has put before us! Jesus is the firstborn from the dead. All others who are finally saved shall also be born as sons of God by a resurrection just as Jesus was, or by instantaneous change at the second coming of Christ, if you are living at that time. We shall be like Him; that is what your Bible says. "...we shall be like him for we shall see him as he is" (I John 3:2). Yes we shall be made like unto His glorious body, His glorified body. (Philippians 3:21) Jesus is God. My friends, have you been reading plain simple scriptures like the ones I just quoted? That we are to be like Him? That Jesus is the firstborn of many brethren and we are to be born and made God like He is and He is worthy of the worship of the angels? HAVE YOU BEEN READING THOSE THINGS IN YOUR BIBLE ALL THESE YEARS AND YET NEVER BELIEVED THEM? Never even got the meaning of what they really say; they mean exactly what they say and that is what they say in plain language. Have you never opened your mind to really see what those scriptures are saying? Yes my friends God is REPRODUCING HIMSELF. He made man in His own image, His own form, His own shape and having mind as God has mind. A mind that can think, a mind that can originate and design and think out ideas. A mind with imagination, a mind with vision and all of those things. Only God made man out of matter — out of the earth, earthy. As we read it in preceding program, whereas God is composed of spirit. Now God made man limited as to mind capacity. Our minds, they are like God's in the sense that we can originate ideas, we can think, we can plan, we can utilize the knowledge we have. We reason, we can design a thing, we can will to do it, we can go ahead and produce what we have designed, only we are limited and we can only do certain things. My friends God has limited us, but even now within the realm of man has come the invention of atomic bombs and hydrogen bombs — guided missiles — so that it is within the power of man to wipe human life off the face of this earth. And if God didn't intervene, that is exactly what we would do. Oh how wonderful that God did limit us that it has taken us six thousand years to come to that place even, where man could invent those engines of destruction so tremendous. God is not limited, but it is safe for God to be unlimited because God will not abuse His great mind power and His great abilities. But He made man limited as to mind capacity, limited as to power and limited as to ability; whereas God is limitless, God is infinite in knowledge and ability. And if you are ever really born of God, you will also be limitless. Think of it! Now God isn't going to give you that until you have decided, until you have striven against sin, until you have proved by every temptation that you do not want to go the wrong way. That you will make the right decision AND YOU MUST MAKE THAT DECISION OF YOUR OWN VOLITION! You must be a separate entity and make your own decision; otherwise you could never enter the family of God. You could never be begotten and finally born as a child of God. There is no other way that God's supreme purpose could ever be carried out. And we are the earthy and as we have borne the image of the earthy — there's the way we are made in the image of God — only in earthiness and in matter and the fact that we are composed of matter. Yes, the wages of sin is death. We are earthy, we are subject to rotting, to decay. We can be DESTROYED if we do not choose to accept eternal life in God's great realm in His kingdom, and under His conditions. But eternal life is the gift of God and you can only have it my friends if you will be like God and if you will abhor sin. And if you will repent of your rebellion against God and His laws; God is the supreme ruler and you're going to be a ruler if you are ever converted. And unless you will repent of your way, because you would rule the wrong way and God is a number of persons IN UNITY, but there is one mind and one unity. And Christ and the Father are one and we must be one with them. So, character then means that we have had to be separate entities. We have had to have free moral agency. We have to choose. Character my friends is something that can be built only by experience and experience requires time and we learn by suffering and by experience. That's why that many are the afflictions of the righteous. That's why my friends God allows us to be tempted. That's why He allows us to have to suffer persecution — that we can grow, that we must overcome, we must grow in grace and in knowledge and the Christian life is a developing period — the training ground. We must grow just like the physical unborn fetus must grow in the mother's womb before it can be born.